Specially trained staff and volunteers spend time handling, grooming, socializing, training and interacting with each animal in our care. Our animals are provided with a variety of interactive toys and receive lots of affection. Our dogs are walked regularly and our cats get time to roam outside of cages where they can investigate, play, and interact with other cats. Some animals arrive at our shelter with health issues. We work closely with area vets to ensure that they receive the treatment needed to maintain a good quality of life. In addition, we work to rehabilitate animals with behavior issues to the best of our ability. Patron animal lovers like yourselves allow us to provide the extra care any of our special needs pets require. No adoptable animals in our care are ever euthanized for age, space, or length of stay. We hope we can assist you in finding a wonderful animal companion for you and your family. Please visit our facility or browse our adoptable pet listings learn about our adoptable animals and adoption process. We update our web site daily and look forward to helping you make a life-long bond with your new best friend today. 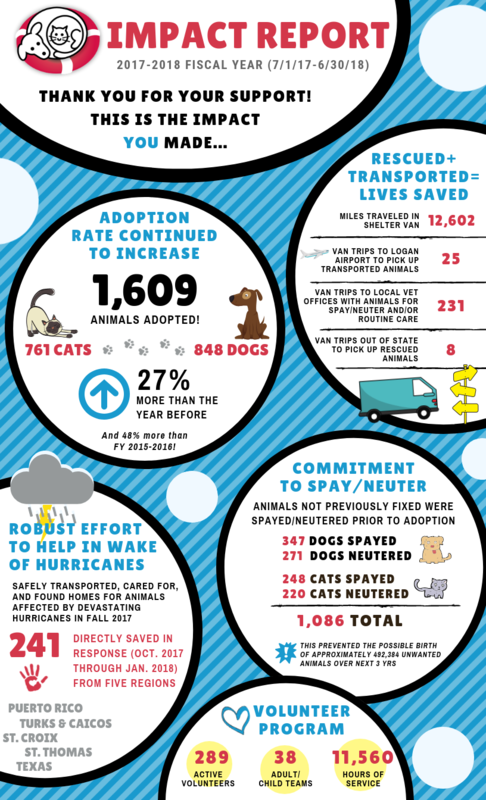 Cape Ann Animal Aid is a participant of Shelter Animals Count and is proud to report our statistics to maintain transparency, identify trends, and consistently reflect upon where we are, where we have been, and where we want to go. The reporting format tracks the status of every pet using a nationally recognized standard known as the Basic Data Matrix, created in accordance with the Asilomar Accords. Follow the links below to download our statistics in PDF format. 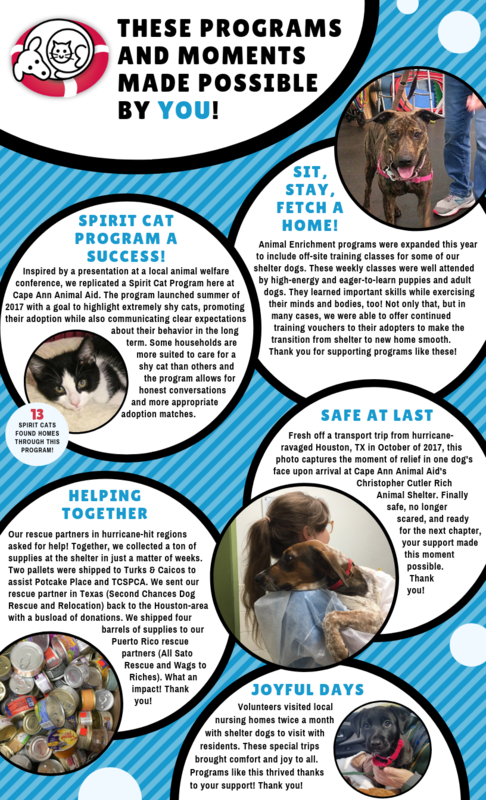 Cape Ann Animal Aid donates surplus cat and dog food and pet supplies to partner organizations that distribute the items to families in need within the community, helping to ensure that they are able to keep their animal companions. For information about receiving food/supplies, please contact The Open Door. Controlling pet overpopulation is important to us. Through this program, Cape Ann Animal Aid will cover the cost of a spay surgery for cats and dogs that have recently given birth. The mother and her babies are fixed and the mother is returned to the owner while the puppies/kittens are adopted out through the shelter. We understand that each individual situation is unique. Please read more about this program here. We are dedicated to providing opportunities for the public to learn more about shelter animals and the work of the CAAA. We periodically host school groups, Scout troops, and other community groups at the shelter to educate and strengthen the human-animal bond at every age. For more information, please contact us at 978-283-6055 or email info@capeannanimalaid.org. We have partnered with Four Points by Sheraton Wakefield Boston Hotel & Conference Center to create this unique program.